As many of you know, Texas has been reeling from an amazingly wet May. The total rainfall for the month was one for the record books. We had so much rain, thunder, and lightning that it came to be the norm rather than the exception for the daily weather. Having spent most of my life in the Southwest I am always grateful for rain on my gardens. I generally view storm clouds – despite the damage they sometimes bring – as a very good thing. But this time, I have to admit we’ve received too much of a good thing. Observe please the photo above of my ‘Silver’ sage. 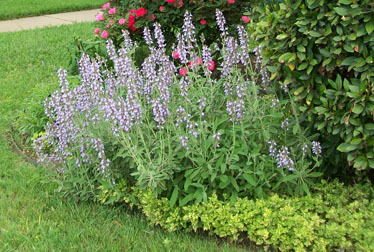 Sage is touted as one of the prime drought tolerant herbs, a good thing for my Texas garden. I’ve had this sage growing here for several years. This photo was taken in mid-April when the thriving plant was in full bloom and the very picture of health. Now take a look at the same plant barely two months later after the heavy rains had taken their toll. It is dead. 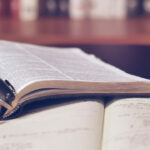 As a doornail. The drought tolerant sage suffered root damage from which it could not recover. What happened? As the rain fell, the soil slowly became saturated with water, filling in all the tiny spaces where air should have been. This put the roots in a permanently water-logged condition. Slowly the roots rotted as the saturation continued. Oddly enough during this time when damage was taking place below ground, above ground the sage looked fine. What few roots were still alive were able to transfer water to the stems and leaves. It wasn’t until after the rains stopped and the high heat of summer resumed that the damage became evident above ground. Then the over-stressed roots were unable to keep up with the water demands. 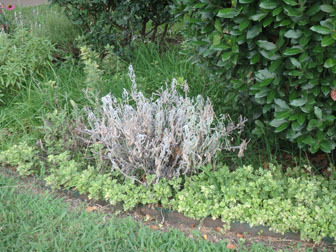 The drought tolerant sage was unable to cope with too much of a good thing and died. If you too live in a region that experienced excessive rains this spring, you may also discover that your wonderfully drought tolerant herbs have been damaged beyond repair. It can be heartbreaking but unfortunately the only thing to do is dig up the plant and buy a replacement. It’s sad but true that too much of a good thing is…too much!